Desk Clock of wood and glass is an alarm clock. With contoured sides, wood top and base finished in satin rosewood accented with satin brass toned plates. 7 1/4" x 6" x 2". Arcade Desk Clock with Presidential Seal on face. Gold plated with high quality quartz movement. 3 1/2" x 2 1/2" x 1 1/2". 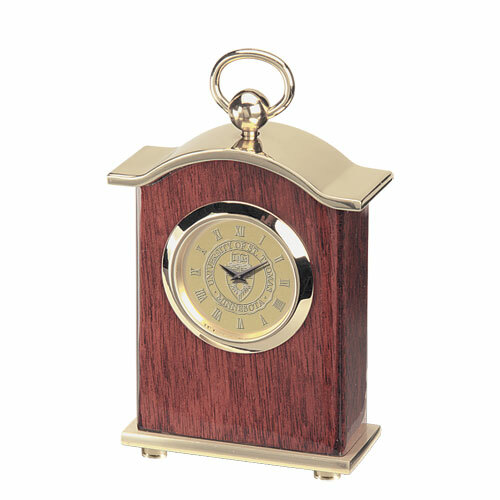 Carriage Desk Clock with piano wood finish and gold tone plated trim. Presidential Seal on face of clock. High quality quartz movement. 3 1/2" x 2 1/2" x 1". 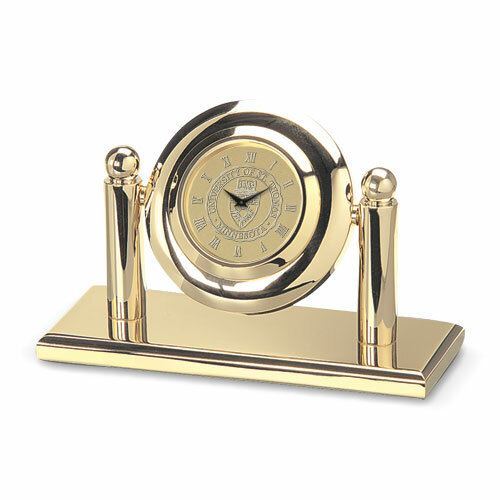 Gimball Desk Clock is a solid two tone swivel desk clock with high quality quartz movement. Presidential Seal on face of clock. Measures 3" in diameter and 2 3/4" high. 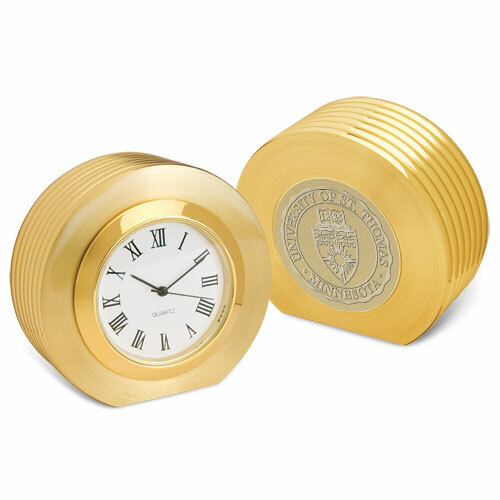 Rotating Cube Weather Station and Clock with Presidential Seal on one side. Piano wood finish on cube and base. Desk weather station is a clock, thermometer and hygrometer. 5" x 5" x 5" on base. 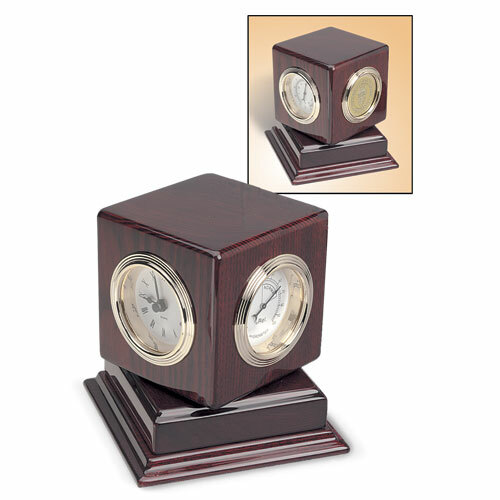 Cube Desk Clock with Presidential Seal on top. Piano wood finish and gold tone plated stand. 1 1/2" x 1 1/2" x 1 1/2" cube on stand. 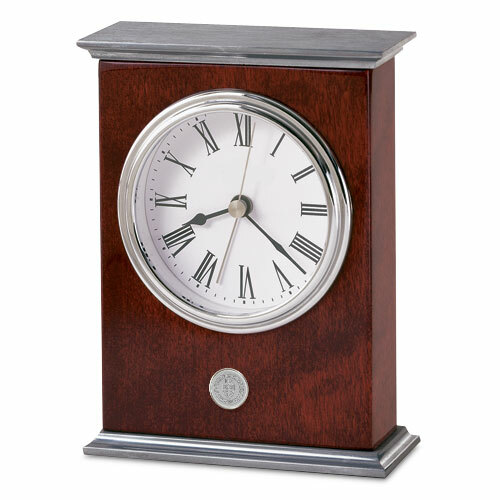 Desk Clock with rosewood finish and silver finished metal top and bottom plates. Presidential seal in silver tone at center bottom. Overall dimensions of 5 3/4" x 4" x 1 1/2". 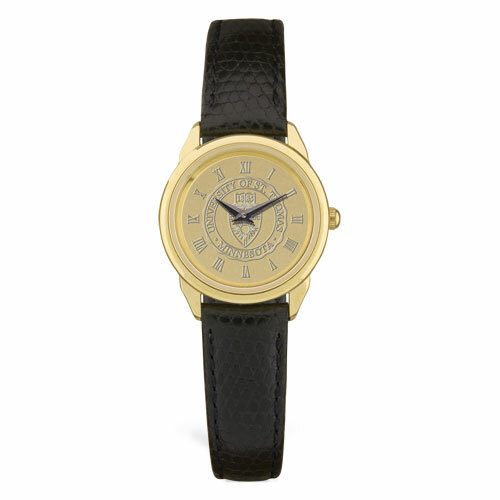 Ladies Wristwatch in gold or silver tone. 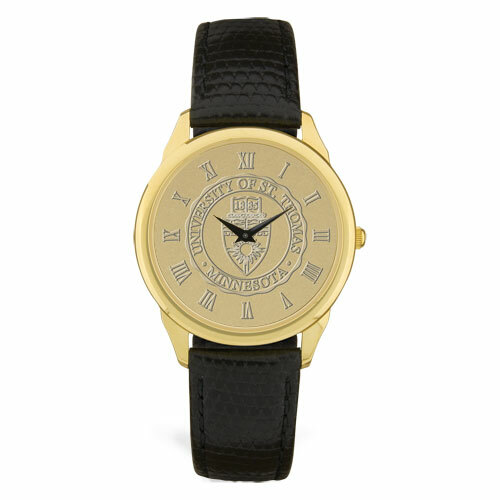 Gold tone is 5 micron 18K gold tone plated case with high quality quartz movement, black leather padded strap and 3 ATM water resistant. Silver is a polished silver tone case, 3 ATM water resistant with a black leather lizard grain padded strap. Please select option for LADIES WRISTWATCH. Mens Bulova Watch in silver finish . Athletic shield on face. A great gift for a grad. Mens Wristwatch in gold or silver tone. Gold tone is 5 micron 18K gold tone plated case with high quality quartz movement, black leather padded strap and 3 ATM water resistant. Silver is a polished silver tone case, 3 ATM water resistant with a black leather lizard grain padded strap. Please select option for MENS WRISTWATCH. 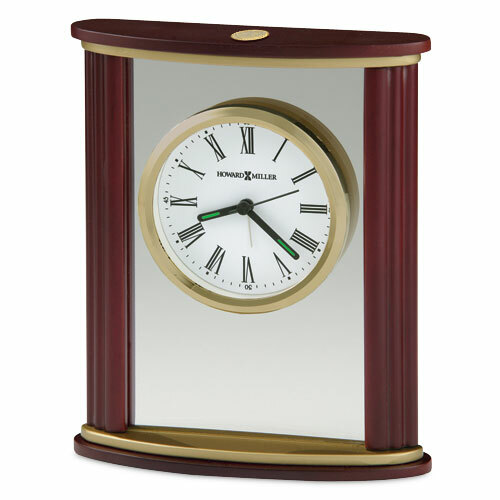 Presidential II Clock in brass tone with Seal on back. 2" diameter x 3/4" thick. 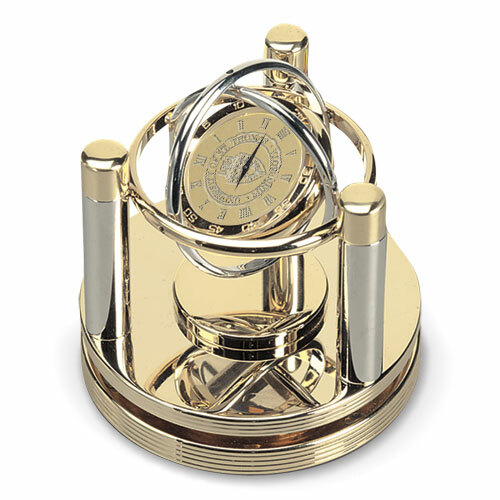 Rodeo II Travel Alarm Clock in gold or silver tone plated. Solid brass clock with Presidential Seal on fold over cover. 2" diameter and 1" thick with cover. Please select option for RODEO II TRAVEL ALARM.